1. DRAGONS. These are not just any normal, run of the mill dragons. These are dynamic, exciting, emotionless, shapeshifting, completely logical dragons. What I loved was that Hartman wasn’t afraid to build a world where dragons were more evolved than humans, and in some respects even more powerful. Because of this, there is a theme of racism that is prominent among the humans, creating a dragons vs. humans political environment that is intense and exciting. 2. Every one has a weakness. While there are bigger plots occurring within the novel, Hartman sneaks in some heartfelt issues that can catch a reader off-guard. Every person within the novel is flawed, dragons and humans alike. While dragons are strong and highly intelligent, they see love and emotion as weakness. Humans are weak compared to dragons, yet because of their ability to empathize and love, they can create beautiful music that fascinates dragons. On top of this, there are “halflings” like Seraphina who are part human, part dragon. This small group of people, while containing the strengths of both species, are considered reprehensible and have to hide their existence. 3. Fabulous female character development. Seraphina is a brilliant character to follow as she begins the book hiding her talent, abilities, and her very essence for fear of being “out” as half dragon. Throughout the novel, she learns to love who she is and realizes that her gifts have so much potential to do good in the world around her. I loved that I was able to see her evolve into this strong female character that grew a spine and never took no for an answer. 4. World building that will knock your socks off. This is one of the best fantasy worlds I have ever encountered in a young adult book. 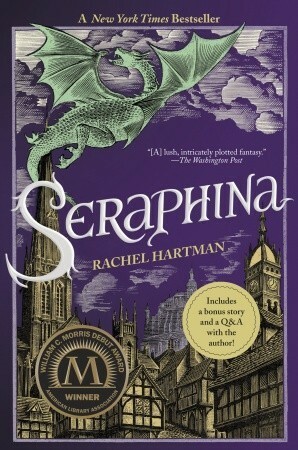 Rachel Hartman does a killer job at creating a structured and believable world that contains details down to the very saint that Seraphina was christened after. This novel has its own unique religion, history, languages, and so much more. While there is so much detail, it is all given in a way that isn’t overwhelming and makes you interested all the more. While this was my biggest struggling point while reading the book, it was a delight to listen to. I am so glad I gave this book a second chance. This is such an exciting and unique story that I would definitely recommend to fans of the fantasy genre. Even if you struggle with reading the book, the audiobook is excellent, something I rarely recommend.